When you’ve got a big family to feed or if you're just a fan of home cooked meals (home made is always best, in my opinion), you have to stay stocked up on cooking ingredients. But keeping everything organized in your pantry and fridge can be quite a chore. If you’re a fan of staying organized and decluttering your kitchen, you need to check out these awesome vintage food label printables from Kitchen Cabinet Kings. There are twelve different labels to choose from. Below are just a few of my favorites. Oh, and they also have a blank label so that you can properly label anything you like! I love the black and white look of these labels. It's clean and elegant and will look good on any kitchen counter or pantry. If you want these labels too, head over to the original post and download them and print them out on your home printer. Then glue or tape them on their appropriate containers. Laminate the top if you want to make them more durable or if you really want them to turn out nice, print them on sticker paper (either at home or at your local print store). 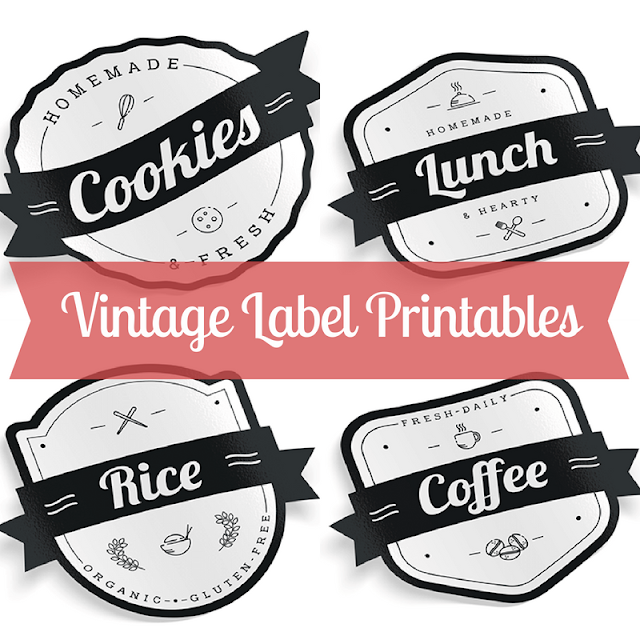 Have fun with your new vintage food label printables and happy Thursday! Images were supplied by Kitchen Cabinet Kings and as such are not owned by me. These labels are so cute! Pinned.